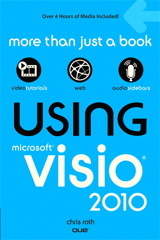 Today’s post, like the Visio Guy web-site, is all about creating smart graphics. 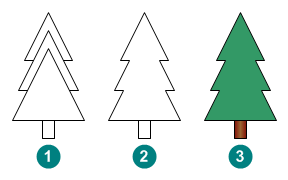 We’re going to create an evergreen tree shape that fades as its size decreases. With this one single SmartShape you’ll be able to illustrate an entire forest-scene that fades into the mist. And you won’t have to format each tree individually. You will learn how to cut Visio shapes into pieces and union the bits together to form new shapes. You’ll learn how to add parameters to shapes, and fill them with Excel-like ShapeSheet formulas create sophisticated graphical behavior. And you’ll create a context menu that resets the shape with a click of the mouse. Now I know what you’re thinking: I need to create Business Graphics! I need to improve my processes, achieve Six Sigma, ensure TQM, improve my score-card, analyze my KPIs, and focus on many things! 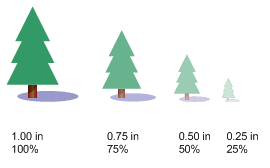 Trees are for the Art Department, Adobe Illustrator and Mac Users! But smart BPM shapes are rather boring to look at, no matter how smart they are. Plus, everything you’ll learn in this article will help you to create smart, parameterized Visio shapes for any application. So turn your monitor away from the corridor, go get a Venti Mocha Frappucino and hunker down with me for twenty minutes or so. As winter descends upon the northern hemisphere, some of you may be tempted to use the office color printer to create holiday greeting cards for co-workers, acquaintances, friends and loved-ones. Well, no Seasons Greetings card would be complete without a forest of evergreen trees, fading into a misty, snowy background! Before we get busy creating smart graphics, we need to have some dumb graphics to work with. So let’s create our evergreen tree. The use of the boolean operation Union (used in step 5) demonstrates a powerful way to build complex shapes from simple primitives. Also note that when we format the trunk, we use Fill Patten 26 to give the trunk a graduated fill that makes it look round. Just select brown for the Color, and a lighter brown color for the Pattern Color. The Trunk Shadow is the little bit just under the Bushy Part that adds depth and realism (stop laughing) to our shape. By giving the shadow a black, transparent fill, we automatically darken the colors of the underlying Trunk shape. We don’t have to worry about selecting two more shades of brown. No matter how the trunk is formatted, the transparent black will simply create a darker version. To make the tree fade as we reduce its size, we’ll create an overlay shape that covers all the tree, trunk and shadow shapes that we’ve just created. Then we’ll set the overlay’s transparency, depending on the size of the whole assembly. The easiest way to align the shapes (in step 5) is to select the Bushy Part, hold down the shift key, then click the Overlay. When you choose Align Shapes…, all shapes in the selection will be aligned to the primary selection–i.e. : the first shape that was selected. 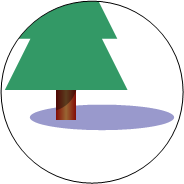 You now have a single Tree Shape, with a transparent overlay that is ready for smartening! Now we need to figure out a way to get the overlay shape become whiter as the tree becomes smaller. When the tree is close to us, it appears to be larger, and less faded. When it is far away from us, it is smaller, and there is more mist between us and the tree, which makes it look whiter. Another way to think of whiter is as less transparent. So 100% transparent is 0% white, and 0% transparent is 100% white! This calculating-the-transparency business will clearly require some math. Luckily, every Visio shape has a an Excel-like ShapeSheet behind it. This ShapeSheet is full of cells and values and formulas, just waiting to be put to good use by a shape developer like yourself! To find the ShapeSheet, just select a shape, then choose Window > Show ShapeSheet. The ShapeSheet is what makes Visio different from so many other graphics applications. It allows shapes to store data and react to graphically to changes in the data, as well as to changes in the size and position of the shape itself. There’s some good ShapeSheet introduction information in an article by John Goldsmith: Just for starters. But for now, you can just follow the tutorial steps, and it will start to make some sense. Click User-defined cells and Actions in the dialog. The row names for our User-defined cells and Action rows aren’t very attractive or useful, so let’s give them some new names. Notice that you don’t have to type in the User. portion of the name. The user-cells allow us to relate the current height of the shape to the original height of the shape. And this allows us to create an expression that decreases the transparency of the overlay as the height of the tree decreases. User.startingHeight holds the starting size of the shape. This is the height at which the transparency of the overlay will be 100%. We are essentially defining the size of the foremost tree in the scene – the tree that has Zero Fading. User.transparency then calculates a ratio between this starting height and the current height of the shape. You can see the height of the shape in the Height cell of the Shape Transform section, located at the top of the ShapeSheet window. The Max and Min bits limit the transparency so that a shape doesn’t become 100% white. The Action row creates a right-mouse menu on the shape, with the text Set Current Size as Starting Height. Try right-clicking your shape and see for yourself! This action will allow us to re-define the starting size for our tree. If we decide in the future that a 3in tall tree should be the foremost tree in the scene, we can resize our tree to 3 in, then right-click this action menu item to redefine User.startingHeight. The SETF function in the Actions.Action cell overwrites the value in User.startingHeight with the current Height of the shape. 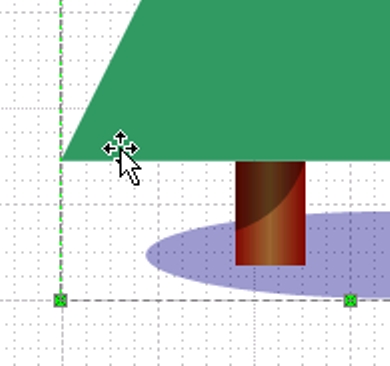 Keeping the ShapeSheet window open, try resizing your shape, then right-clicking this set starting height menu item. You can actually see the value change in the ShapeSheet! Notice also, that the menu item becomes disabled after the first time you click it. That’s because the starting height and actual height of the shape are the same. When the two values are equal, the formula in Actions.Disabled evaluates to TRUE, thus disabling the menu item. We’ve got this nifty context-menu item, but it doesn’t do anything yet. That’s because we haven’t linked the FillForegndTrans cell of the overlay sub-shape to the User.transparency cell in the group. To do this, we’ll need to learn about shape ids, cross-sheet references in formulas, and how to sub-select shapes inside of a group. The id of the group is 1 in this example. 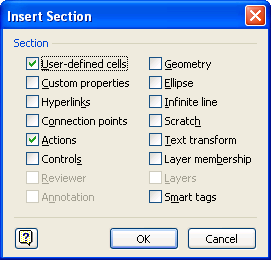 From other shapes, you can reference cells using the prefix: Sheet.1!. Remember that your shape’s id might be different than 1, so you should change the Sheet.1 portion of the formula appropriately. We hope you’ve learned a bit about creating smart graphics in Visio, and that your head is full of ideas on how you can apply this technology and these techniques to your own projects! Visio Film Strip Shapes: Hurray for Hollywood! Previous Post: « Visio for Fashion Design? Very nice intro tutorial, as a newcomer to the backend of visio it helped in adding some context to the initial Shapesheet gibberish, very much appreciated. Glad to hear this was helpful to you! I’m using ShapeStudio but cannot find “Format > Special” in Visio 2007. How do I figure out my Shape IDs? After that, “Format > Special” appears. Funny, I just gave a talk at the Visio Conference about developer Pain Points. One of these is the fact that running in Developer Mode (Tools > Options > Advanced Tab) adds some menu items to the Format menu. One of these is Format > Special, which is the easiest and best place to find shape IDs and shape names. FYI – in Visio 2010 the “Format/Special” option doesn’t appear to exist anymore. It appears the dialog box has changed names to “Shape Name”. It can be accessed on the developer tab (which has to be enabled) by clicking on the “Shape Name” button. Visio 2010 users, if you want to work with the ShapeSheet or do other advanced stuff, such as that discussed in this article, be sure to turn on the Developer tab in the Customize the Ribbon dialog. It’s nice to add to the landscape of the houseplan i made.